Dr. Marta Deyrup received the 2018-19 Albert B. Hakim Faculty Service Medal for her outstanding service to the Seton Hall University community at the Faculty Convocation on Friday, September 14. After receiving the award from Dr. Jonathan Farina, Chair of the Faculty Senate, Dr. Deyrup was given a standing ovation by her colleagues at the event. 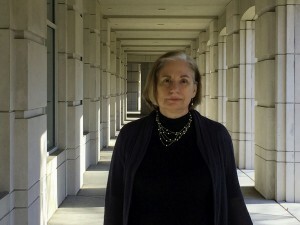 Dr. Deyrup is a Professor and Co-Head of Technical Services at University Libraries. The Albert B. Hakim Faculty Service Award expresses the University’s grateful appreciation and high regard for members of the Seton Hall community who have served beyond measure with selfless dedication and high distinction. The medal bears the honored name of Albert B. Hakim to commemorate his exemplary and extraordinary sixty-two years of dedication and service to Seton Hall University as a professor, dean, colleague and friend. Recent winners of the Faculty Service Medal include: Dr. Judith Lothian, Dr. David Bénéteau, and Dr. Susan Nolan.